Beardy’s & Okemasis First Nation – Chief & Council are pleased to announce a significant step toward economic sovereignty through the signing of a Memorandum of Understanding with Native American Resource Partners (NARP). 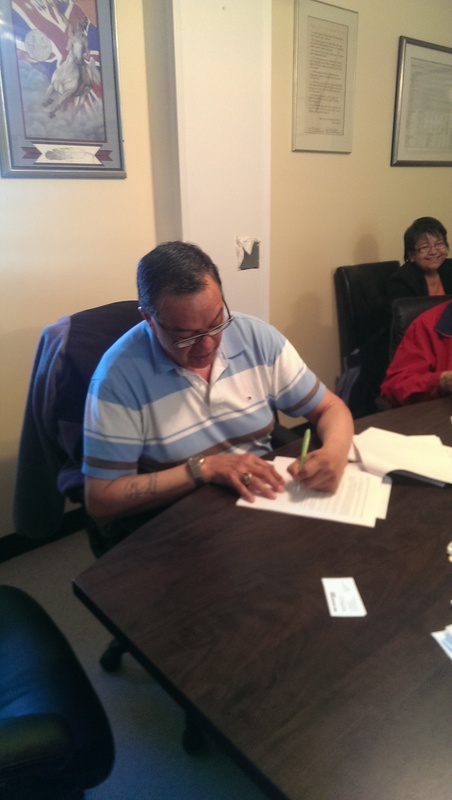 The NARP partnership will enable the Beardy’s & Okemasis First Nation to take the necessary steps toward invitation and participation in the First Nations Oil & Gas Money Management Act (FNOGMMA). On May 15, Chief & Council participated in “Utilizing Legislation to Capture Economic Development Opportunities”- a summit hosted by the Kawacatoose First Nation – the first and only First Nation in Canada to be invited to participate in the First Nations Oil & Gas Money Management Act (FNOGMMA). “The information presented at the summit will enable better relations with another First Nation, but provided the tools and contacts we need to begin this important work” said Seesequasis. “Though these are only our first steps, our people will be engaged throughout the entire process – this is a journey we’re going to embark on together” concluded Chief Gamble.